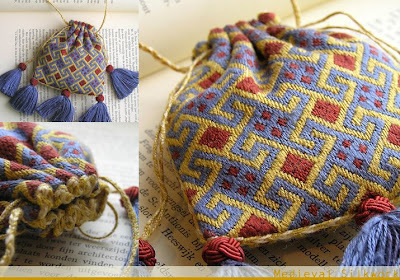 The pouch measures 10x10cm. The tassels are about 5 cm long, each with a turk's head knot. It is embroidered with silk on a linen ground and lined with silk fabric. The seams are finished with loopbraiding and the string is made with fingerloopbraiding. On the back (not shown in the photo's here) a coat of arms is worked into the embroidery pattern. You can see the coat of arms here. In the mean time I have someone making a square embroidery frame, based on period artwork. I can't wait to finish my other embroidery project on it!